A team that scored 66 points last week could only muster 3 seven days later, not good enough to stop the Eagles from flying high in a 27-3 triumph. Wilbert Montgomery was clearly deserving of the game’s MVP award. He carried the ball 22 times for 129 yards and two scores, and also caught five passes for another 130 yards. The Eagles are now 6-4, the Browns fall to 4-6. The Giants shocked even their most staunchest supporters with a ground and pound strategy with third string QB Randy Dean at the helm, starting the game with a TD drive that lasted over 10 minutes. The Giants built a 24-0 lead going into the fourth quarter, and barely survived a furious Roger Staubach rally for the 24-21 win. Billy Taylor took the game’s MVP award, scoring two rushing touchdowns on 18 carries for 67 yards. The Giants move to 3-7, the Cowboys slip back to 5-5. Brian Sipe was the MVP of the week for Week 9, leading his team to a 66-28 drubbing of the Cardinals in St. Louis. Here are the standings at the nine week mark. Pittsburgh and San Diego remain unbeaten, and no team is left with no wins after Detroit’s win over Buffalo. In a Monday Night game that went down to the last play, Seattle outlasted Atlanta 28-21 on a 9 yard run by Dan Doornink with 1:33 left in the 4th quarter. Doornink also took the game MVP award with 99 yards rushing on 26 carries and a TD, also catching 7 catches for 63 yards for another trip to the paint. Seattle improves to 6-3, Atlanta falls to a 3-6. A hail mary pass from Craig Morton to Haven Moses to tie the game at 10-10 at the halftime gun was the turning point as the Broncos rolled to a 31-17 win over Kansas City after trailing most of the first half. Craig Morton took the game MVP award with 235 yards passing and 3 TD’s. The Broncos go to 6-3, the Chiefs fall to 3-6. Larry Csonka played like it was the early 1970’s, not 1979. He became the first player to end an overtime with a TD this season as Miami needed sudden death to doom the Packers, 27-21 after 7:05 of OT. Csonka also took player of the game honors with 190 yards on 34 bruising carries, scoring all 4 Miami TD’s on the ground. The Packers and Dolphins are now each 4-5. In a closer contest than the final score would have you believe, it was the San Francisco 49ers handing Chicago just their second loss of the season, 17-3. Steve DeBerg was the game MVP with 187 yards passing a 2 TD throws. The 49ers end their six game losing streak to improve to 3-6, while the Bears now fall to 7-2. In a battle of two teams who’ve under performed so far, it was the Los Angeles Rams turning back the New York Giants, 20-7. Wendell Tyler won the MVP award for his 131 yards rushing and a touchdown. The Rams go to 3-6 but have now lost backup QB Vince Ferragamo to injury for the next several weeks, the Giants fall to 2-7. Not too many experts were calling for a defensive struggle, but that’s exactly what they got at Riverfront Stadium as the Eagles nip the Bengals 10-7 with a Tony Franklin 32 yard FG with 40 seconds to go. 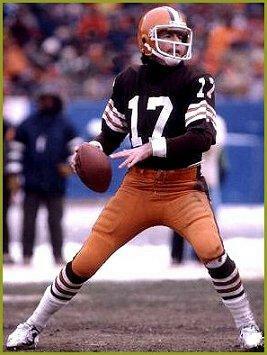 Ron Jaworski was the game MVP, passing for 187 yards on 18 completions on 29 attempts, one completion went for a TD. The Eagles fly to 5-4, the Bengals fall to 3-6.